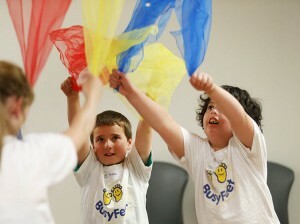 BusyFeet is a dance and movement activity for children with intellectual and physical disabilities, aged 6 to 16 years. The participants experience happiness, and develop more self confidence, through the movement of dance. The dance group meets weekly, 4:30 to 5:30pm during the school terms at the Hawthorn Town Hall. BusyFeet caters for disabilities ranging from various degrees of autism, Down Syndrome, profoundly deaf and cerebral palsy. The extreme differences in abilities and concentration levels pose particular challenges for the teachers and the volunteers. As confidence from both sides continues to grow, these difficulties are progressively overcome. BusyFeet programs run in Stonnington, Bayside and Melton, as well as at Boroondara. The BusyFeet Boroondara program is a joint undertaking of the Rotary Club of Canterbury and the Rotary Club of Camberwell. BusyFeet became a Rotary District 9800 Endorsed program in 2015. A second Busyfeet program commenced in 2018 at Glennalen School. If you want to contact us about BusyFeet Boroondara, please email busyfeet@canterburyrotary.org. A volunteer is assigned to assist each dancer for a school term because a child cannot turn up to find a different volunteer each week. This one on one continuity is very important. Note: All volunteers must have a current Working With Children card. Application forms for WWC card are obtained from Australia Post or Department of Justice at http://www.workingwithchildren.vic.gov.au/. There is no cost involved. Look at the Volunteering Opportunities page for more information about BusyFeet and other volunteering activities. The BusyFeet program is based on the NSW run program, Danceability Australia. Jenni Nankervis from Canterbury Rotary is the BusyFeet Program Leader and she had been assisted until the end of 2018 by Josie Tramote from Camberwell Rotary as the Deputy Program Leader.